Metrodata offer a variety of different products for multiplexing various services, using a variety of underlying technologies, such as Fibre, TDM and SDH. These conversions are performed transparently and so are independent of protocol or router configuration. Comprehensive management functionality is also offered in our powered devices which allows the full range of monitoring and configuration control via either local or remote management. Devices can be managed locally using a terminal, or remotely using Telnet or SNMP via an IP network or in band management. Metrodata's passive CWDM and DWDM Multiplexer family, MetroWAVE, offers a highly effective solution to enable Service Providers to maximise the bandwidth of dark-fibre links. Multiple different services, typically each of up to 10Gbps (even some 40Gbps), are run across conventional single-mode fibre links using different wavelengths. CWDM (Coarse Wavelength-Division Multiplexing) offers up to 16 different wavelengths for running different services, and this number can be increased by moving to or simply adding DWDM (Dense Wavelength-Division Multiplexing) wavelengths. Metrodata offers both CWDM and DWDM multiplexers, which have the added advantage of being totally passive in operation, which being completely unpowered are extremely reliable in operation, as well as being small, light and competitively priced. 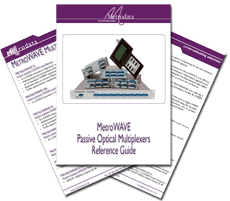 Our MetroWAVE multiplexers are also used by Corporate and Public Sector customers, wherever multiple high-bandwidth or simply diverse services (e.g. Voice, Serial communications, Ethernet data and/or Telemetry) need to be transported across a single conventional fibre link. Metrodata offers a wide range of fibre media converters and fibre modems for different communications protocols, which can be used in conjunction with the MetroWAVE family. Note: Metrodata is additionally able to offer products customised to specific applications. Should you require different port numbers or particular characteristics for any given application, then please let us know and we maybe able to accurately match to your specifications. Vendor compatible CWDM & DWDM fibre transceivers are also available, including SFP, SFP+, XFP and QSFP+, both short and long-haul variants. Metrodata is additionally able to offer products customised to specific applications. Should you require different numbers of ports or particular optical characteristics for your application, then please let us know and we may be able to accurately match your specifications. Emux: products are typically used to multiplex ISDN30 and PBX Voice Trunks and Data from one location to another. This offers a simple method of delivering 4, 8 or 16 E1 services over single, dual or redundant fibre. The MetroLAN product range multiplexes multiple Ethernet, E1, T1, E3 and DS3 services onto STM-1/OC-3 services (or fibre) using SDH technology. Tick to subscribe and learn more about Metrodata products and updates via our occasional newsletter.